We’re excited about our inaugural Mohawk Home Holiday Home Tour, which featured stunning holiday décor in a variety of styles and designs from influencers and bloggers across the country. We were simply blown away by all of these amazing holiday creations. From Washington state to Washington D.C., these curators of gorgeous holiday homes showcased their unique styles and influences. Their home tours ranged from cozy cottages to modern takes on traditional designs, with everything in between. At the epicenter of it all were Mohawk Home area rugs in a breathtaking variety of styles and colors, patterns and designs. We couldn’t be happier with the results from our first Holiday Home Tour; check out these holiday homes for yourselves! Sara’s home is exactly what you’d think of when you’re imagining a rustic farmhouse that’s neatly tucked in between the rolling hills of Utah. Her exquisite eye for design led her to create a holiday living room that featured bright blues and greens and hygge textures. Our Mohawk Home Heirloom rug was the perfect center point for her room, drawing the eye first to the floor before you take in the rest of the warm and cozy holiday decor. Aqua and blues aren’t typically what you’d think of when getting your home ready for the holidays, but Sara took a leap of faith and absolutely blew us away with the results! With all the color and movement of the Mohawk Heirloom Aqua Seti rug, she balanced the rest of the room with muted tones and brought the outdoors inside with the dashing Eucalyptus branches. At her blog, Twelve on Main, Sara describes just how many ways there are to keep things fun and fresh each season. See the rest of her amazing Holiday Home Tour! Parties can either be the best or the worst part of the holidays, but designing your holiday home is always a great time! Laura, curator of Duke Manor Farm, took us on a tour of her modern farmhouse and showcased the perfect space for a holiday party. Here in Georgia, we love to relax with our loved ones and keep things simple during the holidays, and we can definitely see that in Laura’s design! Laura kept the traditional colors of green and red throughout the room, but she let her gorgeous Mohawk Home Laguna Tangier rug really be the focal point. The rug melds well with the other transitional pieces of the room, and fits in perfectly to her overall modern interior decor. Don’t miss out on her other party decoration tips here. Aileen, creator of At Home in Love, kept up the trend of the non-traditional holiday design and it’s absolutely incredible. Her knack for finding gorgeous home décor pieces, at ridiculously reasonable prices, is seen throughout her festive family room. Aileen chose to use a Mohawk Home Heirloom Tamur rug for both its design and durability. The beautiful rug has all the holiday colors, while its traditional design complimented the antique trunk and chairs already in the room. When decorating for the holidays, you don’t have to go out and buy a ton of new décor, especially if you’re on a budget. Aileen shopped her own house and found some older pieces that fit in with her design scheme to create a completely new and festive look. What better way to welcome everyone home for the holidays than with a beautiful holiday entryway? Dave and Heather from The Heathered Nest wasted no time in letting any visitor know that they love the holidays with this absolutely beautiful entryway! Their home is already chock full of traditional designs, but with a bit of a modern twist. 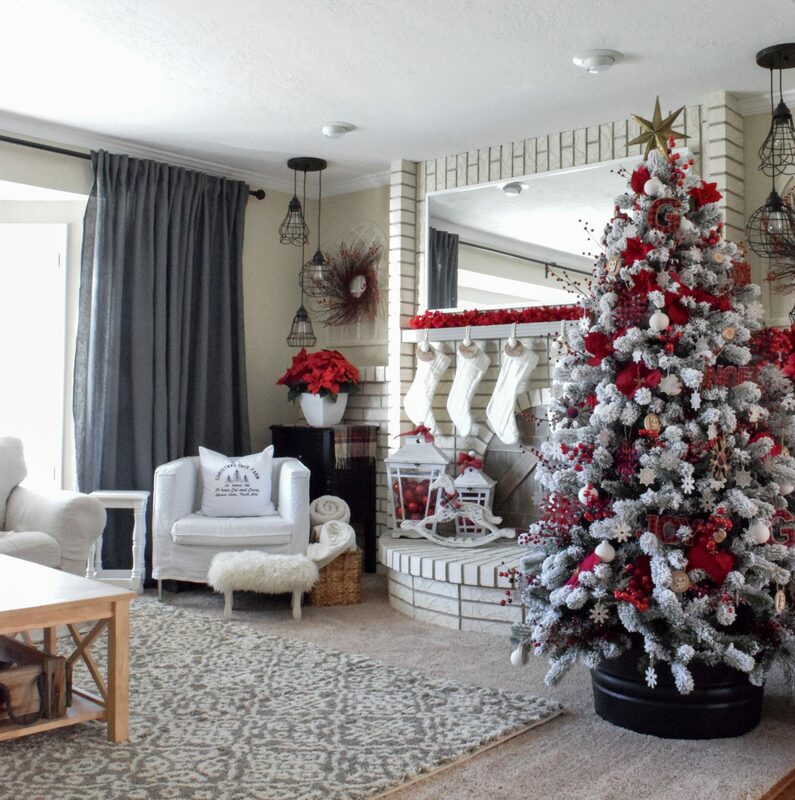 Dave and Heather stayed true to their traditional yet modern style by keeping their faux cowhide rug in front of the tree, then layered the flat woven-style of Mohawk Home Heirloom Thame on top. The golden flecks in the cowhide make the colors of the traditional rug shine just a bit, gives the room a little more of a modern feel, and provides the perfect foundation for their beautifully decorated Christmas tree. To see the rest of their elegant entryway, visit Dave and Heather’s blog. We all love to get a little crafty, especially around the holidays, and Lesley from Chaotically Creative used her DIY skills to transform her dining room for the holidays. Lesley’s home is a wonderful mix of rustic charm with contemporary design. She matched the shimmering whites and blues of the space with a Mohawk Home Patina Vie Studio Luminous area rug, which complimented her beautiful holiday tablescape. Her DIY prowess was evident by her absolutely stunning handmade centerpiece. Burlap garland wrapped around metal buckets provide the room with that hint of rustic flair but the golden flatware and wintertime greens exudes a timeless elegance that we’ve come to love in Lesley’s creations. Visit Lesley’s blog to see the rest of her beautiful dining room! Bungalows are loved because the second you step inside, you immediately feel warm and cozy. Tammy from Our Burlap Bungalow took her comfy little home and turned it into a house bursting with holiday spirit! Whites are hot colors this holiday season and she used them to make the rich holiday reds in her home absolutely dazzle. We wanted to work with Tammy because she is so good at creating a sense of purpose for each room, without completely changing her décor every season. Small touches like a Mohawk Home Laguna Seville rug add an extra layer of texture to the room and the designs on the rug are almost like ornaments for the floor. Tammy also turned her bedroom into a beautiful rustic holiday room. With just a hint of the holiday colored plaid and some mini pine trees and a Laguna Scrolled Ornament rug, she brought the holidays indoors in a subtle fashion. Visit her Instagram to see the rest of her beautiful holiday home! The first annual Mohawk Home Holiday Home tour was an absolute success. We couldn’t be happier with the elegant and festive spaces that were created by every single one of our Holiday Home Tour participants. Do you have a favorite holiday space? Share with us in the comments!